This how-to will guide you through installing a FEMP stack. FEMP is simply a software bundle that consists of 4 components that work together to form a powerful web server. However, in this setup the acronym’s are as follows: FreeBSD 10 (F) is the core of the platform which will sustain the other components. Nginx (E) is used for the web service. MySQL (M) is used for database management, and PHP (P) is used as the programming language. You need a FreeBSD server that is configured with a static IP address. If you do not have a server already, you can visit our Cloud Hosting page and spin a new server up in under 30 seconds. To get started, login to your FreeBSD server via SSH or Console. If you are using the Atlantic.Net cloud service, note that they are setup as minimal installations to avoid having unnecessary packages from being installed and never used. If some software packages that you’re used to using aren’t installed by default, feel free to install them as needed. Let us download nano so we can simplify this tutorial. With the server up-to-date, we can continue the process and install FEMP on your server. You can now verify that Nginx is installed correctly by typing http:// and your IP address on your browser(http://YOUR.IP.ADD.RESS ). The first change to the configuration file is to make a backup of the original config, just in case anything ever happens and we want to revert back. We will accomplish this task by moving the file and renaming it nginx.conf.backup. Paste the following configurations to your empty file then save your session. Note: To simplify our configurations, this file contains the PHP configurations as well. After, we will create the log file directory for Nginx and create the empty log files. This will allow the system o store errors and helpful information for troubleshooting. By default, Nginx has the web files going to the “nginx-dist” directory via a symbolic link. We must remove that link and point it to the correct location that is the “nginx” directory. We then would like to continue by installing MySQL. After running the following MySQL, command hit y and then enter to confirm your installation. This is the secure installation of screen when installing MySql on a FreeBSD FEMP Stack server. Finally, we will conclude with the FEMP Stack by installing PHP and configuring it to work with Nginx. With PHP installed, we can go ahead a begin the preparation to configure it with Nginx. 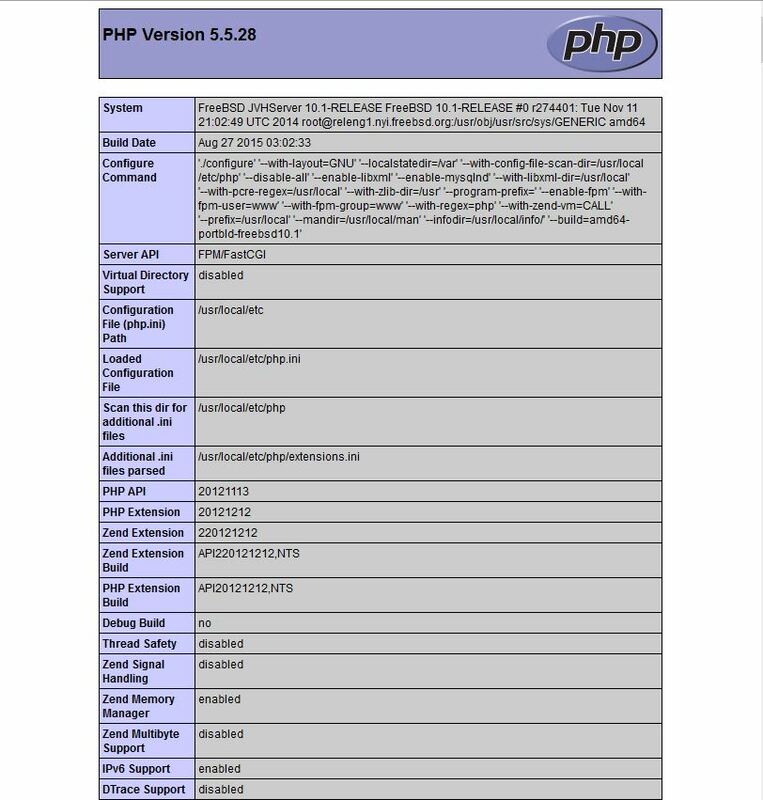 Copy the sample PHP configuration file to the correct location. We will now have to make minor changes to the PHP-FPM configuration. Using your text editor, type the following command to access the configurations. Congratulations! You now have a server with an FEMP Stack platform for your web environment. Thank you for following along and feel free to check back with us for further updates.